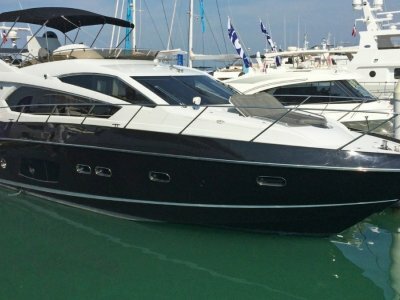 The Pershing 72 needs no introduction, designed by Fulvio De Simoni with an interior every bit as iconic as the boat itself she has been a true success story for Pershing. 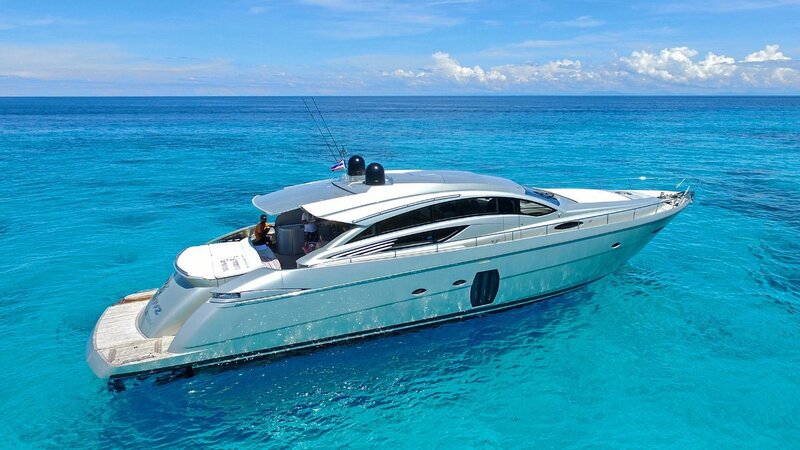 There are many reasons that this Pershing 72 would make an excellent choice for an owner wanting a high level of luxury with reliable performance. Here is why : New superstructure paint work, with recent antifouling and ASD servicing. Upgraded tropical specification for engine room ventilation including air conditioning. New aqua blue underwater lights fitted aft and up to the mid ship master cabin hull windows. Engine and twin get set servicing all up to date ahead of servicing schedule. Diesel fuel polishing system installed in engine room. Full time crew and turn key ready to run at 45 Knots !! Powered by twin MTU 1823hp Arneson surface drives that can propel the boat at up to 45 knots and will happily cruise at 40 knots all day. The aft position of the drives allows for limited vibration as you have no shafts in the boat. This P72 as with all Pershing's is surprisingly quiet when under way. 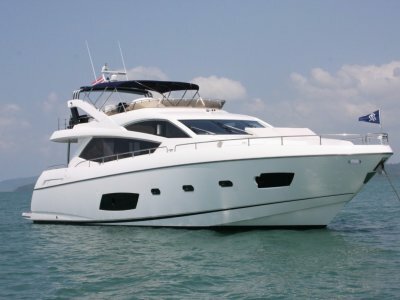 She is a three cabin three head layout which offers accommodation for 2 crew with ensuite and kitchenette. The contemporary interior of the yacht is classic Pershing with the clever use of neutral colours and light oak timber throughout and Paltrona Frau leathers. A full beam master cabin amidships is huge and thanks to the large hull windows either side flood this cabin with plenty of natural light. The VIP cabin is forward with a large ensuite to port. The third cabin is a twin also with its own ensuite which doubles as the day head. When you first step on board you can appreciate the designers vision which obviously had entertaining in mind. The open plan saloon is surrounded by the large side windows at all points of the compass which creates fantastic visibility for all guests at all of the time. One of the boats unique features is the glass window and saloon door that separate the saloon from the cockpit can be fully retracted into the floor of the boat. This clever design allows for the cockpit and saloon to flow into one great venue for day or evening entertaining. It's a unique Pershing feature. Twin gensets for redundancy have been fitted to this highly specified Pershing 72 and the twin tender garage with electric winches and hydraulic ramp for easy launch and retrieval of toys is great. 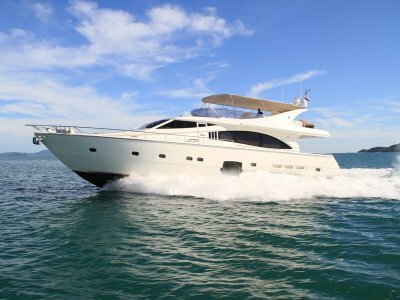 There is a real opportunity to secure a Pershing 72 for a fraction of her new boat value in excellent well serviced condition. 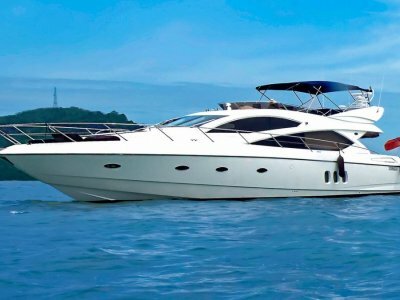 The best way to experience a Pershing is on the ocean, for genuine interest it is possible for a sea trial in the beautiful Phang Nga Bay, Phuket, Thailand. # Full specifications available on request.